Orbits of the natural objects in the solar system exhibit considerable regularity; with the exception of cometary orbits, they are nearly circular, coplanar, and regularly spaced. * Although perturbations due to third bodies must be taken into account for computing definitive planetary ephemerides (Section 5.5% the description of the orbits in terms of Keplerian elements adequately describes most orbital characteristics. The position of the center of mass of the solar system relative to the Sun depends on the relative orientation of the planets, but is typically one solar radius from the center of the Sun in the general direction of Jupiter. Thus, for most purposes we regard the Sun as the center of mass of the solar system and, therefore, as at one focus for all planetary orbits. To define the Keplerian elements for the orbits of either planets or interplanetary spacecraft, we must establish a reference plane through the Sun. The standard plane chosen for this is the ecliptic, or the plane of the Earth's orbit about the Sun. This plane is inclined to the Earth's equatorial plane by about 23.44 deg, an angle known as the obliquity of the ecliptic. The intersection of the plane of the ecliptic and the plane of the Earth's equator define two opposite directions in space known as the vernal and autumnal equinoxes, represented by the symbols T and =a=, respectively. The vernal equinox, the direction of the Sun (viewed from the center of the Earth) as it crosses the equatorial plane from south to north, serves as the reference direction for coordinate systems using either the equatorial or ecliptic plane. Perturbative forces on the Earth cause the rotational axis of the Earth to move in a cone of 23.44-deg radius about a vector perpendicular to the ecliptic plane; this precession of the equinoxes has a period of about 25,700 years. 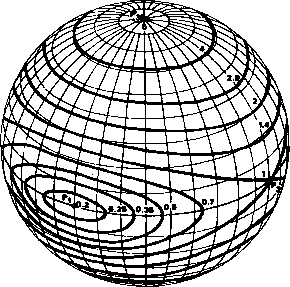 The effect of this precession on coordinate systems is described in Section 2.2.2. Because the Earth's orbit is not perfectly Keplerian, and because of the drift of the vernal equinox, the orbital period of the Earth about the Sun depends on how it is measured. The sidereal year, about 365.26 days, is the period of revolution of the Earth relative to the fixed stars. The tropical year is the Earth's period relative to the vernal equinox and is about 20 minutes shorter than the sidereal year; this is the basis of the civil calendar, since, for calendar purposes, we are interested in the seasons which are determined by the position of the Sun relative to the Earth's equatorial plane. Finally, the anomalistic year, 5 minutes longer than the sidereal year, is the period of the Earth relative to perihelion. * Recall that perihelion is the perifocal point when the Sun is the primary. This shift in the inertial position of perihelion is due to perturbative forces of the other planets. •This section describes qualitative characteristics of planetary orbits. For detailed numerical information, see Appendix L.
* For a piore extended discussion of time measurement systems and precise numerical values, see Appendix J.
measured relative to the ecliptic. The longitude of the ascending node, Q, is the angle from the vernal equinox to the ascending node of the planet's orbit measured eastward along the ecliptic plane. The argument of perihelion, u, is the angle from the ascending node to perihelion measured along the planet's orbit in the direction of its motion. In some tables, « is replaced by the longitude of perihelion, «=<o + R; note that this is not a true angular measure because <o and fi are measured in different planes. Finally, the mean anomaly of satellite orbits is replaced by the time of perihelion passage, T, which is one of the times (usually the most recent) when the planet was at perihelion. Numerical values for the planetary orbital elements are given in Appendix L.
Planetary orbits within the Solar System are fairly uniform in both shape and orientation; with the exception of Pluto and Mercury, the orbital inclinations are all less than 3.5 deg and the eccentricities are less than 0.1. The semimajor axes of the planetary orbits are also nearly regular and are approximately given by an empirical relation known as Bode's Law, in which the semimajor axes of the planets and asteroid belt in AU are approximately 0.4, 0.7, 1.0, 1.6, 2.8, 5.2, etc.